Finally saw The Force Awakens. Great flick. The pacing was just a tad too fast (It felt like they tried to cram the first and second acts of a trilogy into one movie. ), and the ending could have been a little more satisfying (Almost none of the questions were answered. ), but, overall, it felt like Star Wars, in a way the prequels didn’t, and that’s really all I was hoping for. Star Wars has always been a character-driven franchise, so here’s my take on the new characters—including my own crackpot theories on their origins and destinies. I started compiling this list a few months back, but recent events have made me realize that I need to get this out there before they actually start coming to fruition. Some of these shows were cut down in their prime, victims of poor timing. Others had great premises, but suffered from poor execution. Several had long, full lives, and deserve to be remade for today’s audiences. Round about fourth grade, we were expected to learn the multiplication table—the big ten-by-ten grid of all the single-digit integers and their resulting products. Well, I never got the hang of it. Sure, I grasped the concept of multiplication, probably better than most of my classmates, but I couldn’t for the life of me remember that 7 x 8 = 56, or that 4 x 6 = 24, or any of the other, seemingly random facts. To this day, I can’t remember most of the multiplication table. My brain doesn’t work that way. I have a hard time memorizing lists of meaningless things. What I can remember though are rules. Rules have meaning. They can be understood and reasoned out and then applied to a problem. 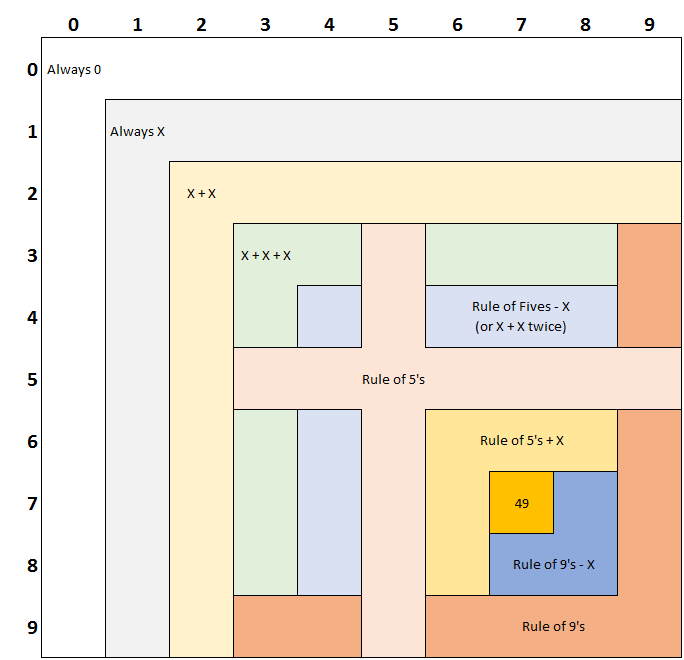 I’d like to share my multiplication rules with the world. This may be completely useless in the computer age, but if I can help some struggling fourth-grader somewhere (or even a struggling adult) to overcome a problem that seems to be so simple for most, it will be worth it.